i finally got the time to finish this! and thanks to those who have wrote in my GB chirstmas messages! and best wishes to you! surtout l'idée du pere noel transmuté ds la main !!! rien a dire ce wall est vraiment super !!!! Nice ^^ There hasn't been an FMA christmas wall yet XD !! This musta been the zillionth time i've said this, but....Merry Christmas and happy new year :D !! It's really a cool xmas wall plus it's from Fullmetal Alchemist, I can see some little "bugs" a the bottom of the wall and the letters are too big in my opinion, still it's a FMA xmas wall, and favorite anime walls holiday related themes are difficult to find!! anyway, it's really nice wall. 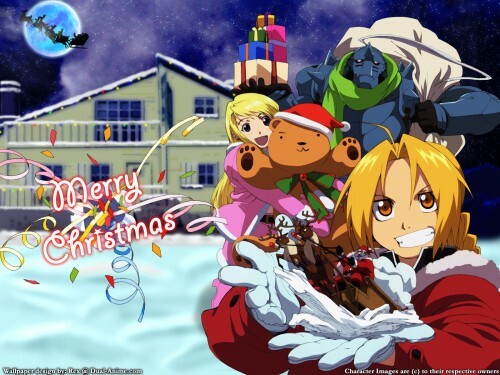 Ooohhh.. nice FMA x-mas wallpaper! So cooL! That's such a nice scan! Anywayz, the bg is awesome and i luv this walL! Hey! Nice scan! Never seen this before, but it looks cool. The reindeer and santa in Al's hand look kinda evil...Well, anyhow. Nice background, great job on the wall! you finally finished it huh. <--never even saw the scan you were using. ^^; Turned out great though. Nice job. the bg is very good,the scan really matches! oh and love the santa in the moon!!! Darn it, I wish I had seen this before, I could have used it as a holiday desktop. Nice use of the scan, the sky and moon are also beautiful. cool! That's a rare pic of FMA, and I've only seen it in small sizes!^-^Nice, nice! (Too bad I didn't see it on the holidays...-_-) Great job on it---hope to see more of your work!